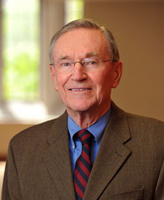 The American Academy in Berlin, Germany’s Wissenschaftskolleg (Institute for Advanced Study), and other prestigious scholarly institutions in Germany recently hosted a symposium in honor of Donald P. Kommers, Joseph and Elizabeth Robbie Professor of Political Science and professor of law emeritus at the University of Notre Dame. The symposium, entitled The Curious Life of the Grundgesetz [German constitution] in America, was held in Berlin. The event celebrated Kommers’ extraordinary body of work in German constitutional scholarship during the year of his 80th birthday. “I was a little uncomfortable through the whole thing because I had never had so much attention directed at myself,” Kommers says, adding that it was humbling to be so honored. And a few years ago, when the country sought to commission a new official translation of its constitution, Basic Law for the Federal Republic of Germany, it was Kommers who got the call. Kommers says that it was his early interest in both constitutional studies and German politics that prompted him to compare American and German constitutional case law. He credits Notre Dame with stimulating this interest when, in 1968, the Western European Studies Program helped to finance the year he spent as a research guest in Germany’s Federal Constitutional Court. Today, Kommers is working on his next book, Germany’s Constitutional Odyssey. “This is an attempt on my part to assess the influence of Germany’s Basic Law on the development of German constitutionalism and democracy over the last 60 years,” he says. “I try to show the extent to which the values displayed in the Basic Law have been absorbed by the German people.” His conclusion? Originally published by Chris Milazzo at al.nd.edu on December 05, 2012.